Here is an itinerary that takes in the great sights of Rome and adds the best of Campania—including Naples, the ancient Roman city of Pompeii, the impossibly gorgeous resort towns of the Amalfi Coast, and the fabled isle of Capri. Don't forget to pay attention to the "Before you Leave" tip at the end of the itinerary covering all the details you need to take care of before leaving home—and be sure to read the "Foolish Assumptions" page about how these itineraries are meant to work. Have fun! The evening passeggiata along Via del Corso. Head north again from the Trevi Fountain, perhaps pausing for another gelato at nearby San Crispino—after all, how will you know which is best if you don't try them all? Naples.ALL DAY: Grab an early morning train to Naples—the earliest you can drag yourself out of bed for (seriously: try the 7:34am IC, which will have you in Naples by 9:30am). This leave you plenty of time to drop your bags at your Naples hotel and head to the clutch of amazing churches in the heart of the old city. Only see what you have time to see before lunch, but be sure you hit at least: the majolica-clad cloisters of Santa Chiara; the art and sculpture inside the gargantuan church of San Domenico Maggiore; and the masterfully, chaotically baroque interior of the Cappella Sansevero. If you have time (I suggest a lunch on the go—at the very least, stop and grab some sinfully delicious pastries from famed Scaturchio on Piazza San Domenico), try to squeeze in the Duomo, San Giorgio Armeno, and San Lorenzo Maggiore as well. Head over to Piazza Dante to catch the R4 bus up to the north end of town to tour of the creepy Catacombe di San Gennaro catacombs (note: last tour leaves at 4pm). 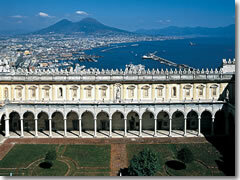 Walk a bit farther up the hill to the Museo Capodimonte, southern Italy's greatest painting gallery. Instead of paying regular admission, get the Campania Artecard, which will get you into many top sights for free—not just in Naples, but across Campania, including Pompeii (» more details). Enjoy the museum's Renaissance and baroque masterpieces by the likes of Caravaggio until they kick you out at 7:30pm. If it's the season and you can get tickets (check before leaving, or at the tourist office when you arrive in town), try attending an opera at the renowned Teatro San Carlo—literally the place that invented prima donnas. If not (or afterwards), grab a pizza in the city that invented it—everyone and their mamma has their own favorite Neapolitan pizzeria, but it's hard to go wrong with any of the choices listed here. 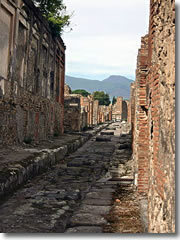 A street at Pompeii.MORNING: Check out of your hotel early, drop your bags at the deposito bagagli (left luggage office) in the train station and just take a daypack. Grab the Metro (subway) line 2 one stop to Piazza Cavour near the Museo Archeologico. See, if you only visit Pompeii itself, you only get half the story, since nearly all of the best bits from the Pompeii ruins—sculptures, mosaics, and frescoes—were carted here for safekeeping, alongside still more amazing ancient statues and art from elsewhere in Campania and from Rome as well. Spend at least 90 minutes in here. After two hours, though, it's time to head back to Piazza Garibaldi and the Naples' Stazione Centrale train station to go see the main event. Naples is as physically safe as any big city, really, but you do need to be extra-vigilant about pickpockets here. This is especially true in the Naples train station, on Piazza Garibaldi just in front of the station, on city buses and trams, and on the Circumvesuviana train to Pompeii and Sorrento.Return to Napoli Centrale train station, collect your luggage, and head downstairs to find the separately-run Circumvesuviana commuter train line (a more-complicated-than-it-needs-to-be procedure detailed here); buy tickets to Pompeii. 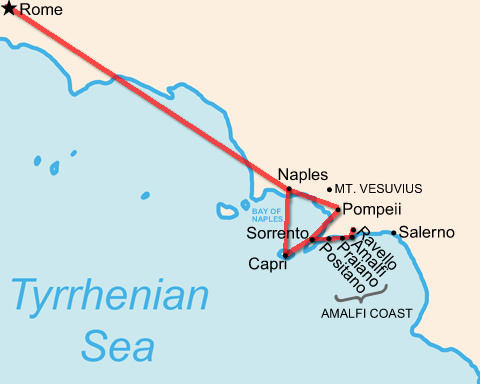 The ride takes 36 minutes (Pompei has two stations; get off at Pompei-Scavi—and yes, the modern town's name has only one "i" at the end). Keep an eye on your bags and pockets; pickpockets infest this train line (see the box on the right). AFTERNOON: You should aim to get to Pompeii around 1pm—yes, just when it is at its most brutally hot in summer, but that can't be helped; we're trying to cram in as much as possible here. Either have packed a bag lunch, pick up something in the Naples train station, or grab a panino from one of the stands across from the Pompeii site entrance. 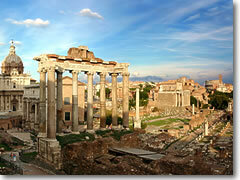 Spend the afternoon amid the amazing ruins of this ancient Roman ghost city. Make sure you bring plenty of water, sunscreen, and a hat. Try to be out of the Pompeii site by 6pm. MORNING: Return to the Sorrento train station, in front of which park the buses that head down the Amalfi Coast. The main itinerary is designed for those who like spending a night in each destination. 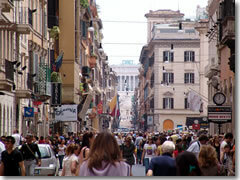 If, however, you prefer to check into just one hotel and make sightseeing sorties from there, Sorrento is perfect. Sorrento is not the most interesting or charming of the coastal towns, but it is heart of the public transport network to tour everything else. If this appeals, book a Sorrento hotel for all three nights of Days 4, 5, and 6. On the evening of Day 5, simply hop a late bus from Amalfi back to Sorrento. On Day 6, board an early ferry over to Capri and return to Sorrento on an evening one. In the morning of Day 7, ride the Circumvesuviana back to Naples, then switch to a train for Rome.If you choose to stay in Amalfi, I wouldn't bother with Positano at all; simply admire it from the bus as you approach and leave town (Positano is a postcard-perfect town on an idyllic little beach, but there's nothing really to see or do), and continue on to Amalfi town. Check into your hotel, check out the famous Amalfi cathedral and the town's other sights, and catch a bus up to Ravello for lunch and an afternoon amid its amazing gardens. Return to Amalfi town for dinner. 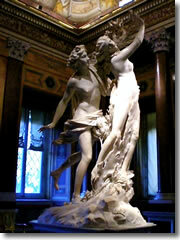 Bernini's Apollo and Daphne at the Galleria Borghese.MORNING: Get up early and make your way back to Rome. 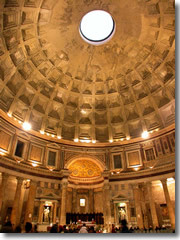 Take the ferry from Capri to Naples, then a taxi or the #1 trolley to the train station, then the train back to Rome. All told, this should take about 2–3 hours total, though maybe as many as four hours if you are unlucky with connections—which is all to say: please do try to get up and off early. Take whatever time you have left in the day to do whatever the heck you feel like. You've earned it—and you're probably getting tuckered out. Personally, I'd spend it back in the medieval artisans district across the Tiber known as Trastevere, visiting its little churches, hanging out in a café, and soaking up the roman lifestyle until it was time for dinner—again, Trastevere is positively packed with restaurants, from the traditional to the trendy, so there's no way you exhausted all the possibilities last night. ALL DAY: Most flights back to the U.S. leave either in the morning or early afternoon. Either way, your last day is largely a wash. You'll spend the morning getting to the airport and the rest of the day flying home. Remember: Even if you have a 3pm flight, you have to check in by 1pm, which means you have to catch, at the latest, the 12:22pm airport train from Rome's Termini train station, which means you have to leave your hotel by 11:30am to head to the train station, which means you need to be checking out by 11:15am... The day's pretty much shot by the time you wake up. Still, take a few minutes to run out to a cafe or bakery to grab one last amazing Italian snack to bring with you on the plane—way better than airline food. My favorite in-flight, make-everyone-else-jealous food is pizza bianca (focaccia), but you should get whatever you like best. A tall order for just one week? You bet. But there are tricks to fitting all you can into such a short time here. You can save time by taking guided daytours to visit the towns and sights outside the big cities in order to (a) pack as much sightseeing as possible into a limited amount of time, (b) get a professional guide, and (c) provide all transportation so you can spend your time seeing the sights and not waiting on train and bus connections.